Bamboo Flooring - Facts and Fiction! Bamboo is a type of grass that grows all over Southeast Asia and China and it has become a high-quality alternative to the traditional hardwood floors. Bamboo Flooring – What You Need To Know! Professionals in the flooring business are always looking for good flooring materials to promote to their clients. They are looking for high-quality floors that look good and withstand everyday lifestyles as well. Bamboo flooring does both these things, and that is why it is a good flooring material choice. Bamboo stalks mature in just five years and reach heights well over 50 ft. Since bamboo renews itself naturally, it is an environmentally friendly alternative to using wood from trees that can take anywhere from 50 to 100 years to mature. Bamboo, a type of grass, grows into a material that is very hard and durable. Bamboo can grow in areas with fair to poor soil, making it one of the fastest-growing plants in the world. Even after harvesting bamboo continues to grow vigorously, which makes it an excellent alternative to “green building”. Bamboo floors are a great way of adding value to your home since they are just as hard, durable, and attractive as traditional hardwood floors. When people are looking for floors for their home, they look for durability, fair pricing, and excellent looks. Bamboo flooring not only looks fashionable and attractive. They are also very durable and almost as hard as steel! Bamboo floors are very environmentally friendly which is beginning to make them more attractive. It comes in many different colors; like light wood, honey, dark wood, and amber that have all been known to be popular. Carbonization and pressure steaming are techniques used to create the dark colors seen on a lot of bamboo floors. 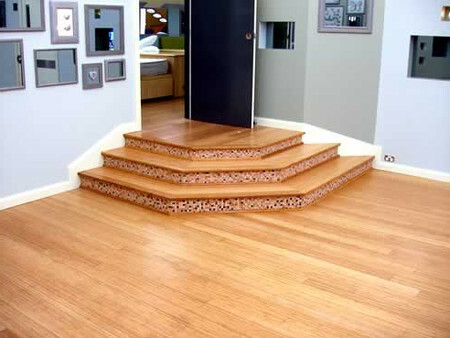 Bamboo flooring panels can also be arranged in many different pattern types. Patterns that are usually seen are vertical or flat grain, and bamboo floors are usually nailed down or floated. Unfinished as well as pre-finished bamboo panels are available and can be found online sold by bamboo suppliers or in flooring centers. Bamboo floors are always a good option when you are looking to buy a new floor. To sum it all up: bamboo floors are cost efficient, durable, stable, fashionable, and environmentally friendly. Any homeowner looking to buy a new floor should give bamboo a chance since they are a cheaper alternative to traditional hardwood floors and are very easy to maintain.